A room in Pod D.C. hotel. Philadelphia is home to a mix of both historical and boutique hotels, but now a new concept is joining the mix: Philly’s first-ever “micro” hotel. 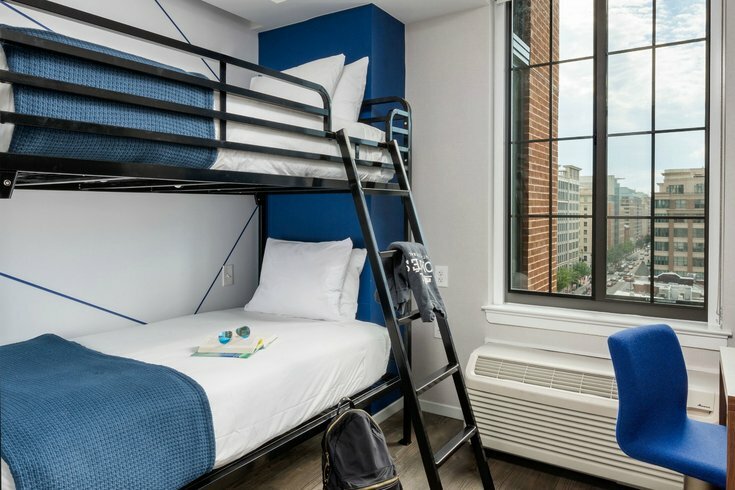 Much like the micro-housing trend seen in apartment buildings such as the Avenir, micro-hotels sport tiny rooms -- in this case, about 170-square feet -- and promise high-end amenities at a cheaper cost. While already more common in cities such as D.C. or New York, Philly will welcome Pod Philly in September 2019, Curbed reported. The hotel is slated for Center City and will include 252 rooms about the same size of a single bedroom -- some with bunk beds. Developer Modus Hotels broke ground on the 11-story project last week at 19th & Ludlow Streets. The pricing is not yet known for the micro-units, but Curbed reports similar hotels in other cities range between $100-$150 a night. In the building will also be a restaurant, coffee shop, workspace, and rooftop bar. The micro-hotel trend growing in cities abroad and domestically is contributed in part to limited space. In San Francisco and New York where space is scarce and expensive, micro-hotels have managed to survive and continue to develop.